Looking for an instant healthy breakfast meal that your family will love? The answer is Ragi dosa! Nutritious, high in dietary fibre, calcium and iron, ragi aka finger millet flour is gluten free, easily digestible with an earthy, nutty flavor. Ragi is popular down South and many families incorporate it in their daily meals in some form or the other. The ragi dosa that I am posting today is similar to the Rava dosa I have posted earlier. The only difference is the inclusion of ragi flour to the basic rava dosa recipe. These dosas are best enjoyed hot off the stove when they are slightly crisp. I always add green chilies, coriander leaves and buttermilk to the dosa batter which gives a subtle spice and tang to the dosa and elevates the flavor by leaps and bounds. 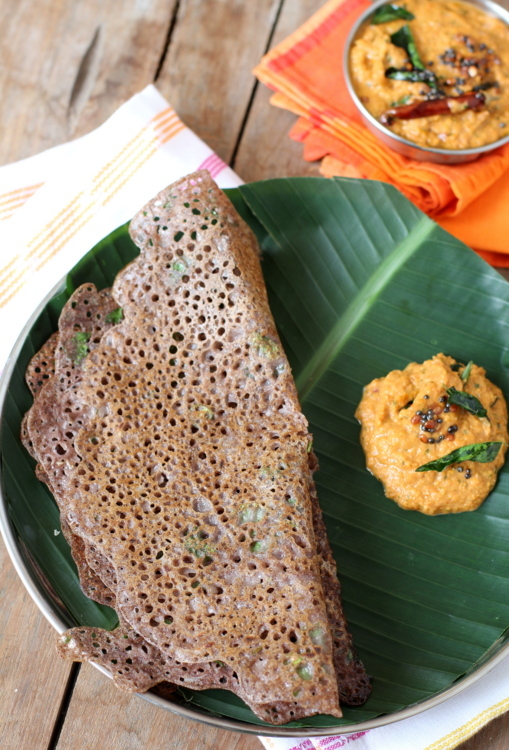 Learn how to make ragi dosa that is instant, easy to make, nutritious and tasty! I have earlier posted step by step pictures and tips on how to make rava dosa which can be followed to make ragi dosa. Mix all the above ingredients (excluding oil) in a large bowl. Add enough water to form a runny batter like thick buttermilk. Pre-heat an iron tawa on high for a minute. Do the water test (sprinkle few drops of water over the hot tawa such that it sizzles) and reduce heat. Pour a ladle full of dosa batter from the outward base of the tawa in a circular motion. Fill the gap in the middle with dosa batter. Donâ€™t drop batter like a thick lump but pour all over, evenly, filling the gaps. Drizzle 1-2 tsps of oil along the edge of the dosa and the gaps in the middle. 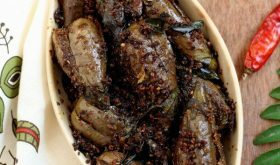 Remove to a serving plate and serve with sambar, chutney or podi of your choice. Buttermilk is optional. Replace it with more water. Chopped onions (1/4 cup) can also be added. Grated carrot or grated fresh coconut make for a nice addition. By Sailu Published: March 18, 2013 Learn how to make Ragi dosa, an easy, healthy breakfast dish. 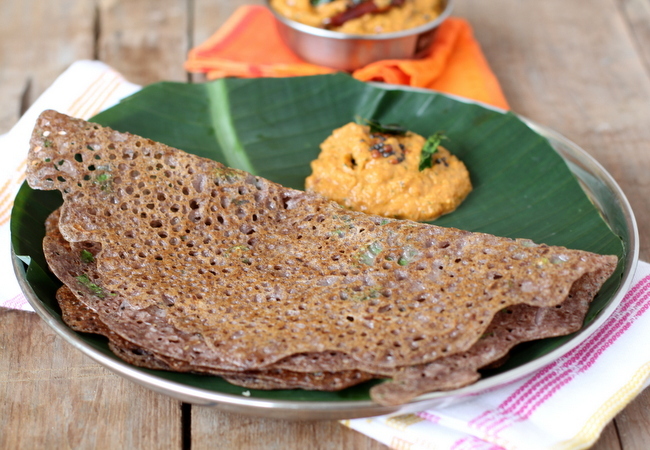 Ragi dosa is made with ragi flour and semolina and goes well with any chutney, podi or sambar. thanks for the recipe, i generally make plain dosas first day from the batter and on second day i add ragi flour, grated carrot,onions,grn chillies,coriander etc….this way also it tastes gud. 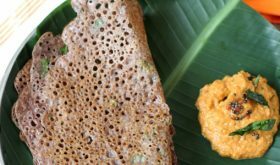 btw, can you tell me whats the chetney you used for this ragi dosa…and the recipe too…thanks. One More idea is to get Ragi+rice+Wheat+Urad dal powdered together, thus avoiding maida altogether! Very healthy and easy dosa.. i love to have anytime of the day..
Sailu.. loved all of your traditional recipes.. this is a wonderful and nutritious replacement of rice flour.. can you please tell me what do you mean by semolina? is this wheat flour? What do you call it in telugu? Thanks!! Semolina is nothing but sooji in Hindi n upma ravva in Telugu. Thank you so much. Just prepared this dosa and it came out so well & I am very happy for this menu.